We are among the small number of Americans who can walk the same beaches, paddle the same waters, and hunt the same lands our ancestors did centuries ago. 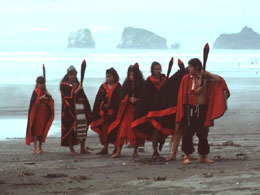 The Quinault Indian Nation (QIN) consists of the Quinault and Queets tribes and descendants of five other coastal tribes: Quileute, Hoh, Chehalis, Chinook, and Cowlitz . Our ancestors lived on a major physical and cultural dividing line. Beaches to the south are wide and sandy, while to the north, they are rugged and cliff-lined. We shared in the cultures of the people to the south as well as those to the north. Living in family groups in long houses up and down the river, we were sustained by the land and by trade with neighboring tribes. Superb salmon runs, abundant sea mammals, wildlife, and forests provided substantial material and spiritual wealth to our ancestors. A great store of knowledge about plants and their uses helped provide for our people. The western redcedar, the “tree of life,” provided logs for canoes, bark for clothing, split boards for houses, and more. We are the Canoe People , the people of the cedar tree. We remember our past while employing modern principles in a marriage that will bring hope and promise to our people now and in the future. The QIN is a sovereign nation with the inherent right to govern itself and deal with other tribes and nations on a government-to-government basis. By-laws established in 1922 and a constitution approved in 1975 form the foundations of the modern-day Quinault government. Our General Council meets annually the last Saturday in March to hold elections, accept new tribal members, allocate fishing grounds, and discuss other issues relevant to tribal operations. The Quinault Business Committee, which consists of four executive officers and seven councilmen, is entrusted with the business and legislative affairs of the QIN throughout the year. The Self-Governance Act of 1988 began as a demonstration project in the Bureau of Indian Affairs (BIA). In 1990, we took the challenge, along with six other tribes, to implement self-rule in Indian affairs. This law was amended in 1991 and authorized planning activities in the Indian Health Service. After 150 years of mismanagement by the federal government, it was obvious that tribes could manage their own affairs better and make their own decisions without external interference. This is the basic underlying philosophy of Self-Governance. Tribal operations consists of the following areas: Administration, Natural Resources, Community Services, Health and Social Services. In addition, we have several enterprises: Quinault Pride Seafood, Land and Timber, Quinault Beach Resort, Maritime Resort, and the Mercantile, all of which promote the growth and develop the potential of our Reservation. It may take another century to correct the many problems created by the “Indian agents” we once relied upon, but we now look to the future while learning from the past. The Quinault Indian Reservation is a land of magnificent forests, swift-flowing rivers, gleaming lakes and 23 miles (37 kilometers) of unspoiled Pacific coastline. Its boundaries enclose over 208,150 acres (84,271 hectares) of some of the most productive conifer forest lands in the United States . Located on the southwestern corner of the Olympic Peninsula, its rain-drenched lands embrace a wealth of natural resources. Conifer forests composed of western redcedar, western hemlock, Sitka spruce, Douglas-fir, Pacific silver fir and lodgepole pine dominate upland sites, while extensive stands of hardwoods, such as red alder and Pacific cottonwood, can be found in the river valleys. Roosevelt elk, black bear, blacktail deer, bald eagle, cougar, and many other animals make these forests their home. Twenty-five thousand years ago, woolly mammoths roamed here as glaciers plowed the land, creating the rolling terrain which makes up much of the Reservation today. The glaciers also created Lake Quinault , the gem of Quinault country. The lake's twelve miles (19.3 kilometers) of shoreline enclose 3,729 acres (1,509 hectares). As a wet, mild climate began to evolve 12,000 years ago, the glaciers withdrew to the higher peaks of the Olympics. These conditions led to the development of forests of centuries-old trees, towering nearly 300 feet into the sky, and a land of untold forest resources. Our Reservation is more than trees and fish. It is people. People remain our most important resource and it takes educated people to fill QIN's many technical jobs. Nearly 700 people are employed by QIN and its enterprises, making it one of the largest employers in Grays Harbor County . We have much to do and limited resources. While we live in a land of great wealth, federal government policies often impoverished our people. During the last three decades, the tribal government has taken the steps necessary to reestablish control over our own destiny and developed a strategic plan as a road map. This plan keeps all the sections of the tribal government focused and heading in the same direction. QIN encourages individuals to develop their own businesses and also maintains many of its own enterprises, such as Quinault Pride and the Quinault Beach Resort and Casino. The only way to predict the future... is to create it. With the combined strength, courage and willingness to work together, we will build a brighter future for the Quinault People.